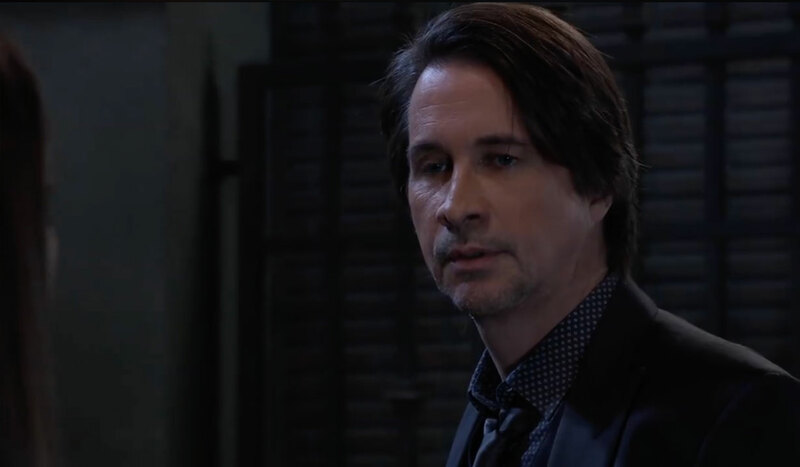 Wednesday April 10, 2019: On General Hospital today, Anna wonders if Robin is really Alex's child, Peter and Maxie share a kiss, Willow and Chase make love, and Jason and Sam plan to rescue Kristina from the cult. Chase and Willow return to his place and share some wine. Willow remembers their disastrous first date when she accused him of luring her back to her lair. They laugh about it and share kisses. Things get passionate, and Chase tells her that he wants her. She wants him too, so he carries her to the bedroom and they make love. Afterwards, Willow tells Chase she had no idea she could feel this way, and the experience was perfect. Finn and Anna take a walk, and Anna admits to Finn that it has occurred to her that Robin could be Alex’s child. Anna reminds Finn that she left Robin with Philomena to raise because she was on the run as a double agent, and she visited when she could. However, she wonders if Alex gave birth to Robin and had those memories implanted in her. Finn believes she’s getting herself worked up over nothing, but Anna points out Drew fully believed Jason’s life was his, so maybe she only thinks Robin is her daughter. She thinks this is why Alex has come to resent her because she raised the daughter Alex gave up. Now Alex is dropping hints as if she wants Anna to realize Robin isn’t her daughter. Finn asks if it is true, would it change anything for her. Anna admits she’ll love Robin as if she’s her own until the day she dies. She wonders how she explains this to Robin. Finn holds Anna as tears stream down her face. Peter sees Maxie home and they plan an official date for the next night. She invites him in, and they end up in a passionate kiss, only to be interrupted by a crying James. Maxie tends to her boy and then returns to Peter, who is admiring a photo of her and Nathan. Maxie thinks since he knows about Nathan and Spinelli that she should get the 411 on his exes. He admits he’s had only brief flings and has never been in love. He thinks it’s best he leaves because he senses she is rushing things to convince herself she’s ready, which she may not be. She promises she will be ready one day. Peter promises to wait. Alexis meets with Sonny at his office to discuss Kristina. Sonny insists he’s handling it, but she fears whatever he may be planning may cause more problems. Alexis tells Sonny about Neil’s advice to encourage Kristina to leave on her own, while Sonny says his expert advised him to get Kristina out and then help her. Sonny feels Kristina is in too deep and they need to get her out of immediate danger now. Alexis doesn’t like it but agrees they need to get her out. Sonny reveals Jason is doing it now. Alexis can’t believe he is only now telling her and hope she isn’t disbarred again for being part of a federal crime. In the attic at Dawn of Day, Kristina signs her trust offering and gives it to Shiloh. He tells her she is very special and to enjoy the ceremony. He will not be present, but Harmony and the other members of the trust will guide her. Harmony presents her with a cup and tells her to drink it to help calm her nerves. Shiloh instructs her to lay down on the bed of pillows in the middle of the floor and reflect on what is ahead. They leave her, and she drinks the tea and passes out. Outside in the back of the Floating Rib, Jason tells Sam he wants to sneak in and grab Kristina from the house, but Sam suggests they distract Shiloh first. Sam calls Shiloh and tells him how she is feeling conflicted about Jason and her path, so he offers to meet her and help her. Jason asks Sam to stall him for at least a half hour so he can get Kristina out. Later, Shiloh meets Sam, who pretends to be drunk and cries about how she misses Jason and is doubting herself. He tries to make her see she is on the right path and doing good work. Jason breaks into the Dawn of Day house and hears Harmony call out to other girls that it’s time for Kristina’s ceremony. Jason quickly heads to the attic and finds Kristina passed out on the floor. He lifts her up and carries her out. Later, Harmony arrives in the attic to find it empty. Back at the Floating Rib, Sam gets a text from Jason that Kristina is safe, so she thanks Shiloh for his help but should get home. He offers to drive her, but she says she can take an Uber. Shiloh leaves, and outside gets a text from Harmony that Kristina is gone. Michael tells Willow that Kristina needs to know the truth. Molly confronts Sam at the Dawn of Day house with Shiloh and thinks she’s lost her mind. Jason explains to Kristina that she was in a bad place and he took her out. Terry and Monica explain to Drew and Kristina there is nothing further they can do for Oscar. Carly explains to Sonny that they don’t know if Oscar will ever wake up.